A monitor showing the first ultra high-energy collisions is seen at the CMS experiment control room at CERN in 2010. Overheard on CNN.com: Will warp drive be possible? The travels of a tiny particle called a neutrino may challenge Albert Einstein's theory of relativity, scientists say. 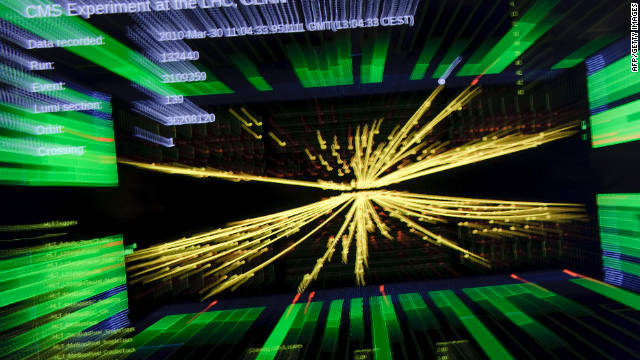 An experiment in Switzerland shows the particles apparently defying nature by traveling faster than the speed of light. Some CNN.com readers wrote the problem may lie with neutrinos rather than with Einstein's theory. Binky42 said, "Neutrinos are too understudied to make assumptions that blast Einstein's theories at this point. There has been no evidence so far (that I'm aware of) that muon neutrinos have mass. It's all based on assumption and not on empirical evidence. They have only scratched the surface of neutrino studies, and all they really know about them is that they are 'weird.'" mcpersons said, "According to the theory of relativity, nothing with a rest mass that can be expressed as a real number can be observed to travel faster than light. Neutrinos were originally thought to be similar to light in that they would have zero rest mass (like particles of light, the photon) and would therefore travel at the speed of light. Some years back, however, it was discovered that there were in fact three types of neutrino, and that each type can 'switch' from one type to another. The theory on how they can 'switch' back and forth was based upon a new assumption that the rest mass of the neutrino was small but not zero: To my knowledge, this was an assumption of the oscillations between the three types, and not independently confirmed." Brian222 said, "People are a little too excited about something that might very well be an error in measurement." kettlecorn replied, "It's not an error, there are other neutrino detectors around the world and at least one other has gotten the same results." Many wanted to know how the discovery related to science fiction theories. enricorosan asked, "Does this mean that warp drive like in 'Star Trek' is possible? Sorry if my question offends people who are very knowledgeable in science." CEW replied, "No, this is more like the FTL drives in "Battlestar Galactica." Warping is like 'bending' space, akin to an artificial wormhole (I think)." kettlecorn said, "More likely in our lifetimes, you will see this result in wireless power distribution, noninvasive surgery, covert surveillance and what is more likely than warp drive: just opening a window to wherever you want to step through to." Weddings may be religious ceremonies, but for many football fans, it's sacrilege to schedule them during football season. Unfortunately, the start of fall marks the yearly conflict between love and scrimmage. Many CNN.com readers said it could be a difficult choice. Owen4 said, "Hmm ... There's so many levels to the analysis here. How close is the person who invited me? My sister? No problem, I'm there. A cousin I barely know? Tougher call. And who is my team playing? Arch-rival or Podunk State? That's why I love these hard-hitting CNN stories; they make me think of such important stuff." grimmsarahn said, "I would choose the wedding every time, but you better believe that I will be checking the score on my phone." PSAGuy said, "So you're a couple of hours late for the wedding. Plane was late; dog ate your directions; bad taxi driver took you to Omaha; there are a million excuses you could have used. Go Huskers!" SC2Pilot said, "Weddings are not automatically prioritized above everything else in the world unless you're the bride. Brides need to get over themselves and realize the world does not revolve around them, even for a day." As for recording the game to attend the wedding, kimaries417 said, "It's not the same to watch it after the fact unless you know nothing about the outcome; and unless you're in a bubble, someone is going to ruin it for you. Plus, by the time you race home to watch it, another game is on." Toxic said, "My sister's wedding was the same day that Navy was playing Notre Dame. As my sister and my mother were fretting over the wedding dress, the priest and I were in the rectory, watching Navy take the lead in the first quarter. I waited a few years before I shared that with my mom. ;-)"
Bex88 said, "We did it. But my husband is a football coach. Most of the invited guests were football coaches. We waited until December, but the Big XII Championship Game (OU vs. LSU) ended up on the same day. Seriously, what are you going to do? We had a big screen TV and made sure there was plenty of time to get from the church to the reception before kickoff." graciegal said, "My best friend got married on the first game of the season for us Cornhuskers. The game was at home, started at 2:30 p.m. Her wedding was at 5 pm. I flew in from Washington and had to miss the game entirely for her wedding. I love her and all but come on. ..."
The third GOP debate in three weeks showed a more confident Jon Huntsman and front-runners Mitt Romney and Rick Perry squaring off over Social Security, immigration and health care, writes CNN's Peter Hamby. Many CNN.com readers expressed dismay over their choices. Friedhuevos said, "I am a lifelong Republican, former military, Christian, and I am not gay. However, the GOP is now so far out of touch with reality, that I, like so many others, am searching for someone who represents us. Wake up Republican zombies. ... Pollution is warming the Earth. Gays are born that way, and Jesus would not support your persecution of them. Use your God-given intelligence to see how the GOP is now alienating immigrants, young people, gays, the poor, the middle class and the intellectuals – and denying all scientific realities. We, the new modern Republicans, will not vote for any of these current GOP candidates." Lykos said, "I've heard a lot of moderate/independent people saying the same thing. We're not overall pleased with how Obama has done things, but we'll still have to give him a vote to keep any of these theocratic sociopaths out of office." CarrotCakeMa said, "All genuine conservatives have LEFT the GOP and are now voting Democratic." Some CNN.com readers were also disturbed by the audience's behavior. ryan1986 said, "If every community has people like the ones in the audience at the debates, who boo servicemen, applaud the death penalty and cheer for uninsured people to die, I don't want anything to do with Ron Paul's vision of America." ragun said, "The let-him-die and soldier-booing, bottom-of-the-barrel Republicans are still a prominent force in politics. Even at an event like this, and on live television, the rabid dogs of the Republican party can no longer keep things to themselves. It's not everyone in the party, but if you don't think that the Republican candidate will make policy with these people in mind, you are a fool. TeaClown said, "Brown Shirts and jackboots ... sound familiar?" Yeah. I gotta hand it to you Cohagen.. This is the best mind fcuk yet. COHAGEN... let deez people have air..
All breakfast cereals should be fortified with neutrinos; then, perhaps we could all move faster and be more productive as a society. There you have it; science made practical. Food for fodder. I enjoyed most of the comments so far. And yes sonostso...wouldn't it be great if we could be faster and more productive? All of this will be more food that I crave for science fiction novels so writers are you listening? If you're a Si-Fi junkie like I am read Fifth Gospel by William Roskey. I think even the skeptics enjoy this book that really takes things to the next level. There's more info at http://5thgospel.com/. “YES,” this does mean that warp drive is possible? And Einstein own E=MC², lets’ say the mass is a ¼ in. cube and all of its’ energy is released at one time its’ sub-atomic particles would move out in all directions at the speed of light [C²]. In my earlier post I said, “YES,” this does mean that warp drive is possible? “BUT” I do not think that Humans will be able to Ride a space at that speed.